What you see when you walk into our classroom can be quite varied depending on the children in our group. We may have younger babies shaking wooden rattles, older babies practicing crawling, and almost toddlers kicking balls back and forth, all at the same time! Come visit us and see for yourself! In Infant 4, our children have the freedom to explore materials freely, in process-focused explorations. What may start as working together to bake ourselves a loaf of banana bread may turn into drawing with our fingers in the flour on the table. With infants, the possibilities are endless! Everyday provides our infants opportunities to engage in activities to meet all of their developmental needs, and our schedule is flexible, depending on the needs of the children in the group. We love to spend time outside, testing our abilities on the playground and stopping to watch squirrels chase each other on a walk in the neighborhood. 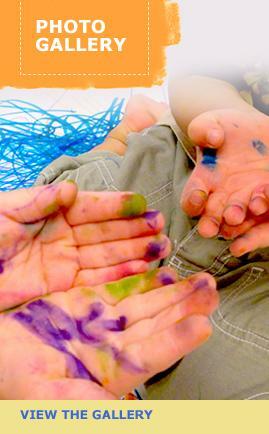 In our classroom, we enjoy exploring sensory materials, such as soapy water or texture blocks, expressing our creativity through art and music (using goopy fingerpaints, sticky tape, wooden maracas, and colorful streamers), and quieter moments, reading books and singing songs together. Everyday is an adventure in discovery in Infant 4!